This past week’s Gutsy Cook menu choices took me back to my numerous trips to France when I lived in Europe. From France I give you the famous Croque Monsieur. And from further north – England, the Apple Charlotte. Since I was pressed for time (which lately it has been happening more and more - aggggghhh!!! 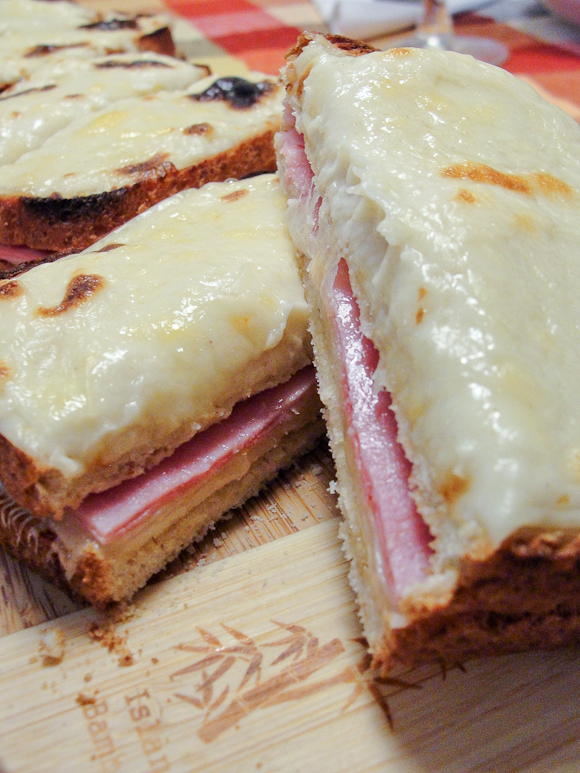 ), I skipped the charlotte and made only the Croque Monsieur. If you are ever in France this sandwich can be found all over the country, while to some it may be a simple hot ham and cheese grilled sandwich, the French take to another level all together and fancy it up. First by using Gruyère cheese (and you guys know how I love that cheese) and coating it with a Béchamel sauce, which once more has cheese in it, turning it to Mornay sauce, then into the broiler it goes and out comes this hot, cheese, toasty goodness. Once you have one, you are pretty much guarantee to never see a grilled ham and cheese the same way again. The best part is that the Mornay sauce stores well in the refrigerator, which makes perfect to make some extra, store and then when you craving that ham and cheese, you can whip this up in less than 10 minutes and feel all French-like. We made this recipe four times so far, and as I write this I’m eating my fifth. But there is more, you can actually top this, how? You can turn it into a croque madame by adding a hat in the form of a fried or poached egg. Or go crazy and make a croque provençal (with tomato) or a croque gagnet, which has Gouda cheese and Andouille sausage? You can also take out the ham altogether, add smoke salmon instead and call it appropriately a croque norvégien. As you can see, the different variations can be endless. But the results are always spectacular. Cut about 4 ounces of the cheese into thin slices and shred the rest. Melt the butter in a medium saucepan over low heat. Remove from the heat and Whisk in the flour, put back on the stove burner and let bubble without browning for 1 minute. Whisk in the milk. Simmer, whisking often, until smooth and thick. Add the shredded cheese and mustard and stir until the cheese is melted. Position a broiler rack 6 inches from the heat and preheat the broiler to medium high. Toast the bread slices on 1 side only. Spread the untoasted sides lightly with butter, then top 4 slices with the ham and sliced cheese. Press the remaining 4 bread slices on top, toasted sides up, and spread with the cheese mixture. You don’t have to, but if you have left over cheese, spread some more on top. Broil about 2 minutes until the sauce is bubbling and golden brown. Serve at once. Note: You can also use Emmental or Fontina cheese instead of Gruyère and they are just as good. As always, you can check out the Gutsy Cooks creations by clicking on their blog links. And if you want to be Gutsy like us, join us.